So, this was the final entry in this week's Stathamithon because I'm all out of Statham movies streaming on Netflix that aren't In The Name Of The King and I don't hate myself enough to ever watch another Uwe Boll movie. 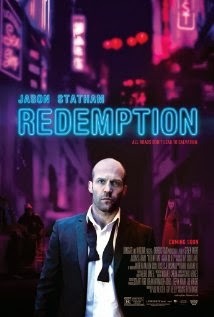 Redemption was actually a bit of a surprise - there was emotional intensity, which is something generally lacking from these sorts of revenge-y action flicks, and the movie actually had moments that were quite dark, and not even in the blown off limbs sort of way. It was a nice portrait of a problematic society (London, in particular) where immense wealth is sharply contrasted with terrible poverty, the two walking side by side but rarely interacting. The only portion of this description that is remotely accurate is that Statham plays a haunted veteran, but even that's a bit misleading. The movie starts with a sweeping overhead intro, a shot of, presumably Afghanistan with some vaguely garbled military-ish voice over. We know that something has gone terribly wrong, but not what. From there, the movie takes place entirely in London. We cut to a bedraggled, long haired (?! ), homeless Statham and a homeless woman getting shaken down for.. drugs? He fights back and ends up having to make a run for it, and ultimately crawls through a skylight on a high-rise building to get away from his attackers. The apartment he crawls into turns out to belong to a very wealthy man on a nearly year-long vacation, and Statham's character takes up residence there in an attempt to pull his life together. The movie really takes off from there, with Statham battling his demons in a sort of partnership with a nun who has some emotional baggage of her own. The homeless woman from the first 5 minutes isn't Statham's girlfriend, and she certainly isn't pregnant - while she's someone he initially cares about, her death is really just a plot device to present to him a choice: does he want to be a good man in the sense the nun wants him to be (as in, honest and merciful) or does he want to be good on his own terms (as in, righteously vengeful). The movie delves into questions of the impact of military service on the human psyche, and, as the title implies, if and how one can find redemption from past horrors, especially murder. The movie is designed so that all the disparate plot lines are engineered to resolve on the same date, which feels more artificial than elegant, but the ending has a pleasant grim resonance that again has more emotional impact than I'd expect from the spectacularly inadequate description. The movie takes a little while to find its feet, but Statham and Agata Buzek, the nun, have a really lovely chemistry that makes the tragic elements of this movie shine. ...is somewhat more accurate, but still, I would argue, inadequate, as it entirely ignores Buzek's role as a powerful shaping force in the movie, specifically of presenting the fragility and inadequacy (and, perhaps, necessity) of traditional morality in a morally bankrupt modern world. "Better than it sounds!" isn't typically a resounding commendation, but for a movie that is tragically misrepresented almost everywhere (Amazon calls it a "high-octane action-thriller! "), I feel like it's worth saying. Expect a quieter, thinkier movie than you'd expect from Statham, and give it a good 20 minutes in to get started - things really start to pick up once Statham's character starts to pull himself together.